What is DRM Removal - is it Legal? 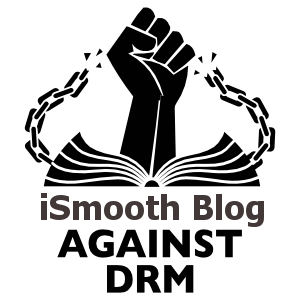 iSmooth Blog DRM-RemovalWhat is DRM Removal - is it Legal? This blog has been providing various DRM-Removal tools and tutorials on how to remove restrictions from digital material. Some readers are just curious to ask about what is the point of DRM-Removal in the first place and whether is it legal or not. We are making it easier for you to enjoy the content that you have bought in the manner of your choice with every right of ownership. However, you must understand that iSmooth Blog discourage illegal misuse and re-distribution of DRM-Free content around the web, as described in our DRM Removal Policy page. You are restricted to use the purchased content only on a certain device. You are restricted to read the purchased e-Book only on a certain e-Reader. DRM gives media and technology companies the ultimate control over every aspect of what people can do with their media. If a company decide to stop running the Media or e-Book we would lose what we have paid for. DRM attempts to make every possible use of digital goods something that must be granted permission for. DRM creates a direction for only few companies to take over the distribution of content in their hands. Some e-Book readers like to write notes inside their books but DRM prevents it. Digital Restrictions Management is technology that controls what you can do with the digital media and devices you own. When a program doesn't let you share a song, read an e-Book on another device, or play a game without an internet connection, you are being restricted by DRM. In other words, DRM creates a damaged good. It prevents you from doing what would normally be possible if it wasn't there, and this is creating a dangerous situation for freedom, privacy and censorship. Any other use of DRM-Removal tools may not be classified as legal, and is the full responsibility of the person(s) utilising the program for the unapproved practice. It is the operation of getting beyond the right to logically own your purchased digital material by circumventing the Digital Rights Management (DRM), which allows you to gain full advantage over your items like: eBooks, Games, Music, Movies,etc. It is not piracy, in order for consumers to really own their legally purchased material they should be able to enjoy it in any way they wish, as long as they ain't sharing it with other people. Warning : Never send the (DRM-Free) content to anybody else and keep it only for self-use. Also, keep in mind that the purpose of removing DRM is to enjoy your legally purchased eBooks or Media without any restrictions. Yes, it's true that DRM-Removal is normally legitimate assuming that you actually realize your obligations towards the DRM-Free content, otherwise it is unarguably illegal to perform that task. Any question or concerns about DRM-Removal can be directed to us via the comment form on this particular post or personally getting in touch with us through our contact form for further clarification.